Originally released 4th July 2007. Cover art by Jim Cheung, Mark Morales and Justin Ponsor. Asst. edits by Alejandro Arbona. Synopsis: A team of New Avengers, lead by Captain America, were dispatched by SHIELD into Latveria in order to jointly investigate a mysterious structure emitting strange readings, and to ascertain why the local Latverian dictator, Doctor Doom, has been suddenly bombing the neighboring country of Symkaria. With Symkaria�s recently acquired status as a nuclear power, the state of affairs is further compounded, and it is up to the New Avengers stop hostilities from escalating before all out war breaks out. Upon their arrival outside of the unidentified building, the small team of New Avengers - which consisted of Wolverine, Luke Cage, Spider Man, along with Captain America - discovered numerous destroyed Doombots. With the help of Wolverine and Luke Cage, the team entered the structure via a "seam" on the outer-wall, but upon entry the team becomes strangely on edge and can't stop arguing with one another. Suddenly, in the midst of their squabbling, the team was forcibly scanned, followed by Spider-Man�s abduction by a speeding black car, forcing the remaining team to withdrawal. Back outside, Captain America calls in reinforcements from Falcon and Miss Marvel. Elsewhere, in shadow, mysterious beings confer over the current state of events, explaining that a machine was being used to make the humans in the two neighboring nations more aggressive, and that the team of Super-Heroes were already exhibiting such behavior. Meanwhile, Spider-Man comes to find himself on an operating table, where Megatron informs him that the wall-crawler will help the Decepticons achieve their greatest triumph. Characters Featured: Wolverine, Captain America, Spider-Man, Luke Cage, Doombots (deceased), Director Hill, Runabout, Wheeljack, Optimus Prime, Jazz, Prowl, Falcon, Ms. Marvel, Megatron, Bumblebee, and Ratchet. Colours by Annette Kwok and Blond. Cover art by Jason Pearson. 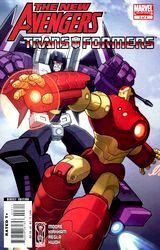 Synopsis: As the Autobots and New Avengers fight Doctor Doom enters the fray and provides enough of a distraction for Ratchet to start fitting Inhibitors to the humans that he has designed that counter the effect of the building. With order restored Doom explains that the device Megatron is using was designed by himself- It was stolen from a nearby laboratory at the same time the building first appeared. Having now fulfilled his exposition duties Doom leaves to go to Symkaria to brook a diplomatic solution. 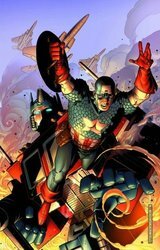 Captain America contacts a incoming Iron Man who confirms the Autobots story as he's been aware of their presence on Earth for some time. 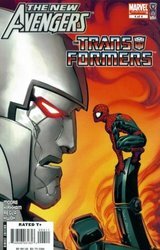 Within the dome Megatron starts to power up his troops with the energy taken from Spider-Man, but refuses the recently arrived Ramjet as he doesn't trust the Seeker enough with that power. Characters Featured: Captain America, Optimus Prime, Spider-Man, Prowl, Wolverine, Bumblebee, Luke Cage, Ratchet, Ms. Marvel, Jazz, The Falcon, Dr. Doom, Iron Man, Runabout, Astrotrain, Blitzwing, Thundercracker, Skywarp, Ramjet, Runamuck. and Ratchet. Cover art by Ed McGuinness. Characters Featured: Captain America, Optimus Prime, Spider-Man, Prowl, Wolverine, Bumblebee, Luke Cage, Ratchet, Ms. Marvel, Jazz, The Falcon, Wheeljack, Thundercracker, Iron Man, Runabout, Runamuck, Skywarp, Megatron, Ramjet, Dr. Doom. Cover art by Tom Raney. Asst. edits by Lauren Sankovitch. Synopsis: Spider-Man inexplicably escapes his bonds, whilst suddenly Dr. Doom, once again, decides to switch sides and fries Astrotrain. Meanwhile, Prowl and Ratchet clarify the need to destroy the psycho-prism. Outside, Iron Man and Megatron come to blows, but eventually the Decepticon is able to trounce the armoured human. Just as he is about to explain his odd decision not to fight Prime, Megatron realises that the remaining Autobots have vanished, who, miraculously, remembered that they have a teleportation device (i.e. orbital bounce), allowing Bumblebee, Jazz, and Wolverine to simply beam into the base. Inside, they find that Spider-Man has agreed to let the Autobots use Megatron's device in order to give them Spider-Powers. Ratchet and Prowl power up and head back into the fray, whilst the other Autobots, Wolverine, and Doom go off to destroy the Prism. With the battle joined, Megatron is soon badly battered. Back in the dome, the Prism is found guarded by Ramjet, who seemingly unbothered allows Wolverine to smash it. As the base explodes around them they all flee except for Doom, who for reasons best known to himself prefers to whittle on to himself instead. Megatron orders the other Decepticons to retreat, but plans to finish off the New Avengers personally, until Spider-Man ties him up allowing Luke Cage to push him over. With that final humiliation, Megatron teleports away making "Next time Gadget" proclamations. 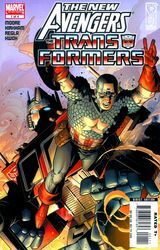 Characters Featured: Captain America, Optimus Prime, Spider-Man, Prowl, Wolverine, Bumblebee, Luke Cage, Ratchet, Ms. Marvel, Jazz, The Falcon, Wheeljack, Iron Man [Both in his super size suit and a normal one], Astrotrain, Dr. Doom [Killed-or IS HE?!?!] Megatron, Ramjet, Skywarp, Thundercracker, Runabout, Runamuck. Publisher solicitation: It�s time to Assemble�and Roll Out! What in the world could unite Earth's Mightiest Heroes and the Autobots? Maybe the Decepticons and Dr. Doom know! War is about to break out on the border between Latveria and Symkaria � unless two unique teams of heroes can unravel a dark mystery�that is, if they don�t destroy each other first! 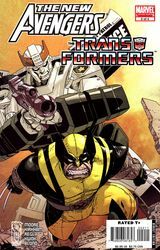 Stuart Moore (WOLVERINE, PUNISHER X-MAS SPECIAL) and Tyler Kirkham (X-MEN: PHOENIX WARSONG) bring together fan-faves like Wolverine, Megatron, Spider-Man and Optimus Prime in this all-new widescreen adventure! Collecting NEW AVENGERS/TRANSFORMERS #1-4.